Who are we and where are we really? The Universe that we were born into is a unique system that works flawlessly. It is perfectly clear in every way and conceals its greatest surprises within each one of us. We can all understand the Universe and our place within it. And with ONE, we can now discover how special we are. What does the future promise? 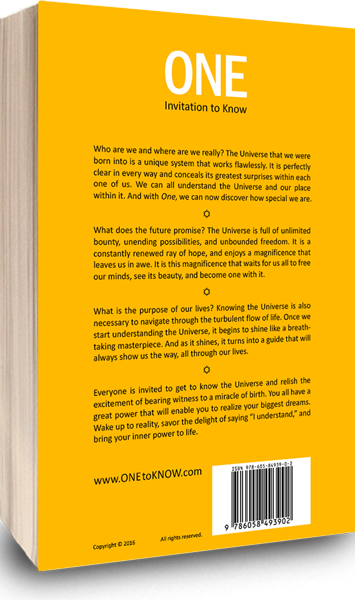 The Universe is full of unlimited bounty, unending possibilities, and unbounded freedom. It is a constantly renewed ray of hope, and enjoys a magnificence that leaves us in awe. It is this magnificence that waits for us all to free our minds, see its beauty, and become one with it. What is the purpose of our lives? Knowing the Universe is necessary to navigate through the turbulent flow of life. Once we start understanding the Universe, it begins to shine like a breathtaking masterpiece. And as it shines, it turns into a guide that will always show us the way, all through our lives. Everyone is invited to get to know the Universe and relish the excitement of bearing witness to a miracle of birth. You all have a great power that will enable you to realize your biggest dreams. Wake up to reality, savor the delight of saying “I understand,” and bring your inner power to life.